Warning: this document is preliminary and changes to it will occur frequently. It’s fine to build prototypes according to the information presented for experimention only, but for production level hardware. If you want to produce Arcade-compatible boards, please contact us at arcadehdw@microsoft.com. Students can run and create Arcade games in the browser, on either a computer or a mobile device. While the focus of Arcade is clearly games, the screen and the buttons give flexibility in the kind of programs that can be created to teach various computer science concepts. The focus of the Arcade API design is ease of use. The entire screen is typically re-drawn on every frame and the users can place sprites at arbitrary places on the screen. Not coincidentally, this specification also lends itself to a hardware implementation. Screen data for resolution and depth at 160x120x4 bits takes a little under 10kB. We need at least two sets of screen data for double-buffering and the user is very likely to use two or three more for various sprite operations. This, together with heap fragmentation concerns, effectively requires the hardware to have at least 96kB of RAM, though more is clearly better. In addition, 512kB of flash and 64MHz or more are recommended, but these usually follow from the RAM size. Other than the MCU, variants contain the same components (with optional variations in the power supply). If you have good reasons to use a different screen or accelerometer, let us know. We anticipate the future need of various configurations for screen controllers, as well as different accelerometers, etc. Thus, we generate the same UF2 file for all boards of a given variant, and have the runtime look for configuration values in the bootloader area (called CF2 configuration). See https://github.com/Microsoft/uf2/blob/master/cf2.md for more details on the configuration format. The bootloaders can be binary patched with new configuration data if needed. The configuration data also includes the assignment of a GPIO pin header. Generally, the header isn’t essential to this board, but it’s recommended to at least leave holes for people to solder it in. The exact pins where the various BTN_*, JACK_*, and DISPLAY_* lines are connected are specified in the bootloader. You can change them as described above. The STM32F41x series is listed to run at 100MHz, but to support USB we need to run them at 96MHz. We support 48 pin and larger packages. Only STM32F412 in 64 pin and larger packages support a parallel screen interface, which is required if you want to use ILI9341 320x240 screen. Other choices are possible, and we would love to hear your feedback. The 4 directional buttons, the A/B buttons, and the MENU button are to be connected to GND and a respective MCU pin, as in the schematic below. There is an internal pull-up enabled on the MCU, so thers’s no need for external pull-ups. The RESET button is to be connected to the MCU hardware RESET line (refer to the MCU documentation how to exactly connect it and if it needs any additional components). The schematic also shows the recommended button arrangement - directional buttons on the left of the screen, while A/B are on the right of the screen. A is above and to the right of B. MENU is best placed somewhere below the other buttons, and RESET is best placed next to the USB connector. If you have good reasons to use a screen not listed below, let us know. The screen connection is through the hardware SPI module. The purpose of the DISPLAY_BL is to dim or shut off the screen. The schematic shows one way of doing this. Experiment with the value of R2 to get optimal brightness. Others, however, are also available - searching for ST7735 or ILI9163 usually yields the right ones. They cost out at around $2. The board should have a sound source. You need to figure out how to connect it properly and what kind of amplifier you might need. The headphone jack is optional. Also note that this jack is NOT for JACDAC networking, for that see JACDAC. Warning: JACDAC is under development now and changes to it are ongoing. It’s fine build prototypes according to this schematic, but not for to production versions of hardware, just yet. Please contact arcadehdw@microsoft.com for more information. JACDAC is a protocol for networking over a single-wire connection with optional power delivery. It lets you play multiplayer games by connecting two (or more with a headphone splitter) Arcades together. JACDAC power delivery is still under development. You should leave the tip of the jack connector disconnected. While the schematics use a 3.5mm jack connector with switches, you can also use one without switches, as they are not used. This is sufficient to play multiplayer games. If requested, we can add support for MSA300, which might be a cheaper alternative. The accelerometers should have the SDA, SCL and INT1 lines connected to each respective ACCELEROMETER_* line as defined in the bootloader. If possible, keep this separate from the SDA/SCL exposed on the header to keep the one on the header available as a general digital IO line. An optional vibration motor can be connected to VIBRATION line. Software will keep it low during normal operation, and pull it high to activate the motor. The board will have auto-power-off feature to improve battery life. Currently, we plan to shut down display back lighting, and the accelerometer if any, and put the CPU in sleep mode. There is an optional PWREN pin. If defined, the software will pull it high on boot, and keep it low during sleep. The idea is for it to control the power supply to the display, accelerometer, and other on-board components. Please do not provide a power LED that cannot be turned off from the MCU. It’s fine for a power LED supply to be controlled by PWREN. An optional BATTSENSE can be connected to a voltage divider and to the battery. This is not yet supported in software. 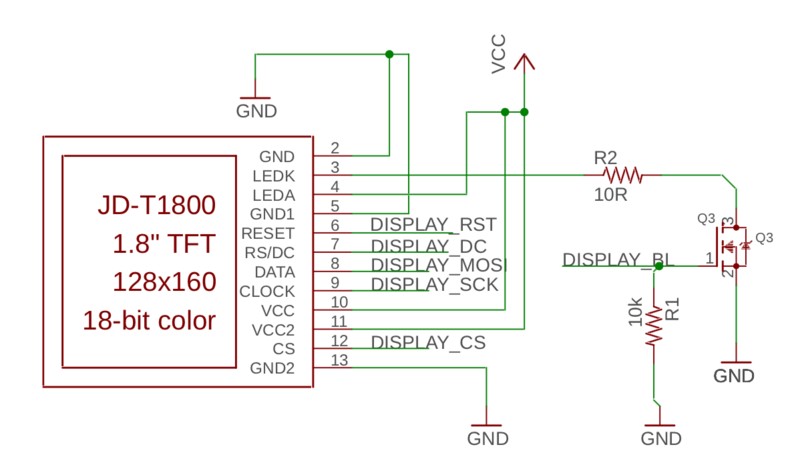 Up to 4 LEDs can be defined. The first two can be also used for JACDAC status. Following is the recommended pinout of the header. A header is optional, but at having least holes to add pins later are nice to have. If there’s limited space for header pins, D10-D11 should be dropped but leave D8-D9 remaining. The assignment is shown for the 64 pin (or larger) version of F4. For the 48 pin version, drop D8-D11 and connect the accelerometer SDA/SCL on the header. While there is recommended pinout in this document, you can use a different pinout. You need to put your pinout in the bootloader and flash the bootloader. Then, when you get a UF2 file from Arcade website, it will at runtime look for settings in the bootloader and use the right pins. Of course, if you’re building a guide about how to just connect a screen and buttons to an existing board, all other components really are optional. There are 2 different bootloaders to support the hardware variants. These bootloaders support the CF2 configuration data section. The following bootloaders do not support the CF2 configuration data section yet. maybe you can at least leave holes for people to solder a header in? Once you’re done with all these changes, drop the board.h file onto https://microsoft.github.io/uf2/patcher/. Once you’re done patching, press “Apply my patch”, which will download new board.h. Note that you need to use the patching website to put the right header and size in the configuration data. It’s also possible to patch a binary file of the bootloader with new config using the same website. The patching website can also remove config entries, just specify the value as null. End users will typically update the bootloader by copying a special UF2 file, which has a user-level application that overwrites the bootloader. To prevent misuse of this feature (eg., one student emailing to a another a malicious UF2 file which writes a non-functional bootloader), some bootloaders (currently only F4) implement a protection feature. When booting, the bootloader will check if it’s write-protected (this is done by setting bits in flash, which only take effect upon reset). If the write-protection is disabled, presumably during a bootloader update process, the bootloader will present a screen to the user asking if they really want to update the bootloader and that doing so could possibly brick the board. If the users agrees to upgrade, the app is allowed to run (and presumably update the bootloader). Otherwise, the protection is re-enabled. The default configuration of the bootloaders have this feature disabled to ease the development process. To enable it, set BOOTLOADER_PROTECTION = 1. STM32F4 requires an external crystal for stable USB operation. The software takes the installed crystal frequency from a specific bootloader location, but best to stick to 8MHz. The following is the recommended pinout. The recommended pinout for header was described above. It’s consistent with the config for the generic F4 in the bootloader repo. JACK_TX needs to be on a pin with external IRQ and PAD0 of some SERCOM. JACK_SND needs to be on `PA02 (DAC output).